The Hoosiers missed an opportunity to show the conference that the team was turning the corner with a disappointing 29-7 loss to Penn St. A week after being a spark against OSU, Zander Diamante fizzled out with a lackluster performance this week. He only completed 9-of-17 passes for 90 yards and with no Jordan Howard in the backfield, Indiana had zero offensive balance and could only muster 240 total yards. With speculation about the status of head coach Randy Edsell dominating the news, Maryland came out and showed some fight in the 49-28 loss to Ohio St. Out of desperation, Edsell decided to try something new at quarterback, because it was beyond obvious that Caleb Rowe wasn’t the answer, and started junior Perry Hills… and he played well. While his passing yards did not stand out much (10-of-27 133 yards) it was what he did as a rusher — 25 carries for 170 yards — that kept the Terrapins in the contest. Maybe this is part of why Edsell was eventually fired — his inability to be flexible with the line up. You can’t blame the lack of offensive creativity in this closer than expected 31-24 victory over Rutgers as Connor Cook passed for 357 yards and two touchdowns, but for Spartan fans you have to be honest and realize something isn’t right with this team. Going into the season I mentioned how the run game would be key and to see them be outrushed 141-131 with all that talent in the backfield has to be frustrating. Receiver Aaron Burbridge put on another show (nine catches 146 yards) but outside of he, Cook and freshman LJ Scott — who had two touchdowns, including the game winner — no Spartan played up to the No. 4 ranking. Another game… another shutout. This game was expected to be a low-scoring slugfest but Michigan had other ideas in the 38-0 drubbing of Northwestern. The team scored in every facets of the game and the tone was set by an opening kick-off return by receiver Jehu Chesson. The Michigan defense limited the Wildcat offense to 168 total yards, sacked and continually harassed the Wildcats quarterbacks into forced throws — including a pass that was intercepted by cornerback Jourdan Lewis that was returned for a touchdown. The two-headed quarterback system finally worked in the 49-28 victory against Maryland. Quarterback Cardale Jones did most of his damage outside of the 20 yard line — 21-of-28 for 291 yards and two touchdowns — and J.T. Barrett ran the offense within the redzone as he rushed for 62 yards and three touchdowns runs of three, one and 18 yards. The defense still has work to do, as it allowed over 253 total rushing yards, but when it needed big plays down the stretch it got them; safety Tavis Powell and defensive end Sam Hubbard both had interceptions and lineman Tyquan Lewis had two sacks. The Nittany Lions were without star running backs Saquon Jones and Akeel Lynch but it didn’t matter as quarterback Christian Hackenberg was effective both with his arm and his feet in the 29-7 win over Indiana. Hackenberg was 21-of-39 for 262 yards and two passing touchdowns — but he was also effective as a runner with two rushing touchdowns and a long 22 yard scamper. Receivers Brandon Polk and Daesean Hamilton both scored on 39 yard touchdowns and provided the PSU quarterback with reliable targets on the afternoon. Cornerback John Reid had an interception for a Nittany Lion defense that also sacked the Indiana quarterbacks four times. Simply put… the Fighting Illini got run over in the 29-20 loss to Iowa. Despite allowing 278 rushing yards, Illinois was still in the game thanks to a tough defense that bent significantly but seldom broke and forced the Hawkeyes into three field-goals. Unfortunately the offense had its own troubles scoring touchdowns as the Illinois offense was stymied in the third quarter and had to settle for two Taylor Zalewiski field goals. Wes Lunt, despite the inability to get into the endzone more, had another productive game passing for 317 yards. Receiver Geronimo Allison was the primary benefactor catching eight passes for 148 yards — including a 53 yard score which closed the gap to 23-20 in the fourth quarter. The sign of a very good team is the ability to run the ball and play opportunistic defense and it looks like the Hawkeyes fits the bill. In the 29-20 victory over Illinois, the Hawkeyes found a weakness in the Fighting Illini defense, its run game, and exploited it to the tune of 278 yards — 256 of that by Jordan Canzeri. In addition to the monster rush performance CJ Beathard provided enough balance as he passed for 200 yards and two touchdowns. The Hawkeyes defense forced two turnovers and outside of a fourth quarter touchdown stymied the Illinois defense most of the afternoon. Someone must have shown the Golden Gopher offense my critique of their offense last week as they made sure to show up and play well in the 41-13 blowout win of Purdue. It did help that the Minnesota defense forced four turnovers — two interceptions by Jason Myrick and one by De’Vondre Campbell — and shortened the field for most of the day, but the offense still had to capitalize on the good field position… and that they did. True freshman Shannon Brooks had the breakout game of his young career as he rushed for 176 yards on only 10 carries. Because of the success of the run game — the team ran for 326 total yards — quarterback Mitch Leidner was not asked to do much, and he obliged by only passing for 59 yards on 8-of-12 pass attempts. There have to be Wildcat players that are still trying to find out what happened in the 38-0 blowout loss to the Michigan Wolverines. It seemed as if every aspect of the game fell apart as they allowed a special teams, offensive and defensive touchdown. Leading rusher Justin Jackson was limited to only 25 yards — 102 yards below his season average — on 12 carries. Defensive end Deonte Gibson was the lone bright spot defensively finishing the game with 2.5 sacks and five tackles. Purdue scored to start and finish the game against the Minnesota Gophers, but everything in between went terribly wrong in the 41-13 blowout loss at home. David Blough passed for 207 yards but had three crucial interceptions — including one that was returned for a touchdown — and the Boilermaker offense looked nothing like it did against MSU the prior week. D.J. Knox continued to play well despite the lopsided score as he rushed for 60 yards on 13 carries. Playing from behind most of the afternoon, the offense tried to keep pace as it had two 40+ yard receptions by Danny Anthrop and Shane Mikesky but only converted 3-of-17 third-down conversions which essentially killed any offensive continuity. In a game that the team sorely needed the Badgers came through with a clutch field goal late to defeat Nebraska 23-21. Joel Stave passed for 301 yards but it took an un-Badger like 50 pass attempts. Even with the offense being more pass oriented, the run game came to the rescue when it mattered most as Dare Ogunbowale rushed for 117 yards on 32 carries. Kicker Rafael Gaglianone missed a 39 yard attempt early in the game but came through when it mattered as he nailed a 46 yard field goal with only seconds remaining. 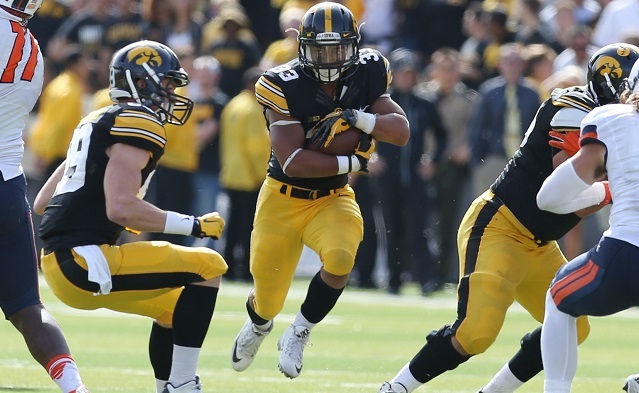 Jordan Canzeri: Running back Iowa – Iowa is leading the pack in the Big Ten West Division and its due in part to the senior from Troy, NY. On the season Canzeri is averaging 116.2 yards per game but against Illinois he put on a show rushing for 256 yards on 43 carries — including a 75 yard run that showed off his burst and speed. If the Hawkeyes are going to contend for the Big Ten championship it will be because of this guy and his legs.